In a feat that may provide a promising array of applications, from energy efficiency to telecommunications to enhanced imaging, researchers at UC Santa Barbara have created a compound semiconductor of nearly perfect quality with embedded nanostructures containing ordered lines of atoms that can manipulate light energy in the mid-infrared range. More efficient solar cells, less risky and higher resolution biological imaging, and the ability to transmit massive amounts of data at higher speeds are only a few applications that this unique semiconductor will be able to support. "This is a new and exciting field," said Hong Lu, researcher in UCSB's Department of Materials and Department of Electrical and Computer Engineering, and lead author of a study that appears as a cover story of the March issue in the journal Nano Letters, a publication of the American Chemical Society. Key to this technology is the use of erbium, a rare earth metal that has the ability to absorb light in the visible as well as infrared wavelength -- which is longer and lower frequency wavelength to which the human eye is accustomed -- and has been used for years to enhance the performance of silicon in the production of fiber optics. Pairing erbium with the element antimony (Sb), the researchers embedded the resulting compound -- erbium antimonide (ErSb) -- as semimetallic nanostructures within the semiconducting matrix of gallium antimonide (GaSb). ErSb, according to Lu, is an ideal material to match with GaSb because of its structural compatibility with its surrounding material, allowing the researchers to embed the nanostructures without interrupting the atomic lattice structure of the semiconducting matrix. The less flawed the crystal lattice structure of a semiconductor is, the more reliable and better performing the device in which it is used will be. 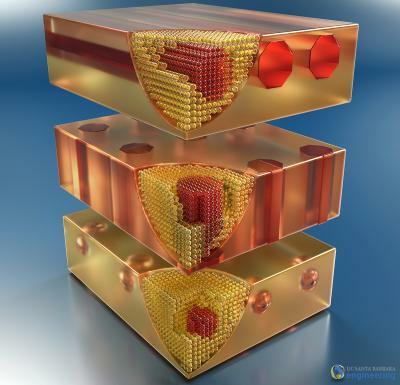 "The nanostructures are coherently embedded, without introducing noticeable defects, through the growth process by molecular beam epitaxy," said Lu. "Secondly, we can control the size, the shape and the orientation of the nanostructures." The term "epitaxy" refers to a process by which layers of material are deposited atom by atom, or molecule by molecule, one on top of the other with a specific orientation. "It's really a new kind of heterostructure," said Arthur Gossard, professor in the Materials Department and also in the Department of Electrical and Computer Engineering. While semiconductors incorporating different materials have been studied for years -- a technology UCSB professor and Nobel laureate Herbert Kroemer pioneered -- a single crystal heterostructured semiconductor/metal is in a class of its own. The nanostructures allow the compound semiconductor to absorb a wider spectrum of light due to a phenomenon called surface plasmon resonance, said Lu, and that the effect has potential applications in broad research fields, such as solar cells, medical applications to fight cancer, and in the new field of plasmonics. Optics and electronics operate on vastly different scales, with electron confinement being possible in spaces far smaller than light waves. Therefore, it has been an ongoing challenge for engineers to create a circuit that can take advantage of the speed and data capacity of photons and the compactness of electronics for information processing. The highly sought bridge between optics and electronics may be found with this compound semiconductor using surface plasmons, electron oscillations at the surface of a metal excited by light. When light (in this case, infrared) hits the surface of this semiconductor, electrons in the nanostructures begin to resonate -- that is, move away from their equilibrium positions and oscillate at the same frequency as the infrared light -- preserving the optical information, but shrinking it to a scale that would be compatible with electronic devices. In the realm of imaging, embedded nanowires of ErSb offer a strong broadband polarization effect, according to Lu, filtering and defining images with infrared and even longer-wavelength terahertz light signatures. This effect can be used to image a variety of materials, including the human body, without the risk posed by the higher energies that emanate from X-rays, for instance. Chemicals such as those found in explosives and some illegal narcotics have unique absorption features in this spectrum region. The researchers have already applied for a patent for these embedded nanowires as a broadband light polarizer. "For infrared imaging, if you can do it with controllable polarizations, there's information there," said Gossard. While infrared and terahertz wavelengths offer much in the way of the kind of information they can provide, the development of instruments that can take full advantage of their range of frequencies is still an emerging field. Lu credits this breakthrough to the collaborative nature of the research on the UCSB campus, which allowed her to merge her materials expertise with the skills of researchers who specialize in infrared and terahertz technology. "It's amazing here," she said. "We basically collaborated and discovered all these interesting features and properties of the material together." "One of the most exciting things about this for me is that this was a 'grassroots' collaboration," said Mark Sherwin, professor of physics, director of the Institute for Terahertz Science and Technology at UCSB, and one of the paper's co-authors. The idea for the direction of the research came from the junior researchers in the group, he said, grad students and undergrads from different laboratories and research groups working on different aspects of the project, all of whom decided to combine their efforts and their expertise into one study. "I think what's really special about UCSB is that we can have an environment like that." Since the paper was written, most of the researchers have gone into industry: Daniel G. Ouelette and Benjamin Zaks, formerly of the Department of Physics and the Institute for Terahertz Science and Technology at UCSB, now work at Intel and Agilent, respectively. Their colleague Justin Watts, who was an undergraduate participant is now pursuing graduate studies at the University of Minnesota. Peter Burke, formerly of the UCSB Materials Department, now works at Lockheed Martin. Sascha Preu, a former postdoc in the Sherwin Group, is now assistant professor at the Technical University of Darmstadt. Researchers on campus are also exploring the possibilities of this technology in the field of thermoelectrics, which studies how temperature differences of a material can create electric voltage or how differences in electric voltages in a material can create temperature differences. Renowned UCSB researchers John Bowers (solid state photonics) and Christopher Palmstrom (heteroepitaxial growth of novel materials) are investigating the potential of this new semiconductor.